How does an enduro bike differ from a trail bike? Or an all-mountain bike? There may not be a massive difference but small details all add up. Here’s our rundown of what makes a great enduro bike. 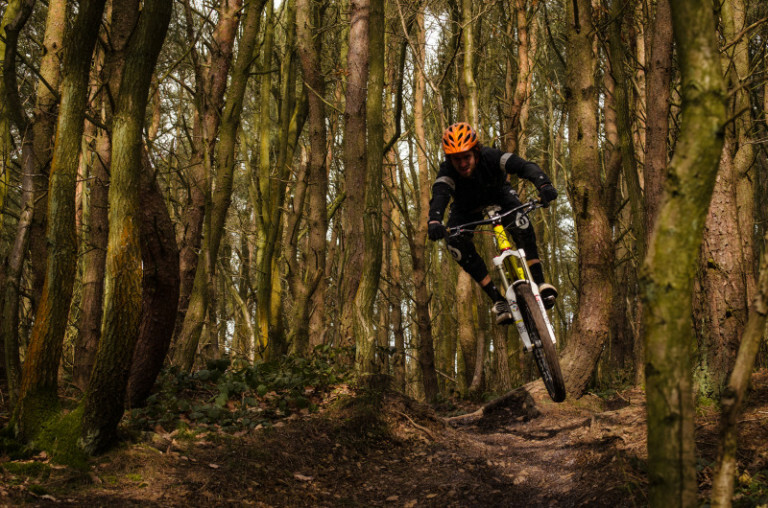 Fitting between Trail bikes and Downhill bikes, Enduro bikes are full suspension bikes sporting 140mm-170mm of travel designed to be ridden aggressively on technical trails. They still need to be pedalled around all day, so low weight and efficient riding position are still desirable. Enduro bikes don’t have to the preserve of Enduro race courses. Riders who do ‘Trail’ riding terrain but place an emphasis on aggressively attacking the technical sections can often be well served by an Enduro bike. A minimum of 140mm travel is the norm for Enduro bikes. The majority of Enduro bikes will have 150mm-160mm of travel. The suspension designs will vary greatly from manufacturer to manufacturer. Each brand has their own bespoke design and each design will work a bit differently. Some will bias bump absorption, others will prioritise pedalling efficiency. The differences won’t be huge but Enduro racers are concerned with subtle variations and finding the perfect bike for their particular riding style. The suspension will offer a high degree of adjustability too (damping feel, amount of travel), so that riders can tweak the bike’s handling for different sorts of trails and trail conditions. In the Enduro genre, carbon bikes are a more common choice than they are in other genres. Most Enduro bikes are still aluminium but there’s a more significant number of high end carbon bikes to be seen in the line-ups of Enduro races. It makes sense to go carbon if you can afford to. With Enduro requiring almost-Downhill levels of suspension travel and frame strength, without using carbon the bike can end up being undesirably heavy. The majority of Enduro bikes have 27.5in wheels. This in part is due to the relative absence of hard-hitting 29in componentry that has been available up until now (forks, wheels, tyres). It’s also to do with rider height and rider experience. Riders shorter than 5’7” can find 29in wheels combined with long travel ending up compromising standover. Perhaps more importantly, Enduro riders are simply more used to riding smaller wheels. 27.5in wheels handle very similarly to 26in wheels whereas 29in wheels require a significant adjustment in riding style and technique. There’s plenty of evidence that 29in wheels are faster but there’s still the question mark over whether they’re as much ‘fun’. It’s a funny old world. Enduro bikes have developed rather ‘Jekyll and Hyde’ geometry. By that we mean that they’re designed to do two things: steady seated climbing and ragged, out-of-the-saddle, trail attacking. Steep seat angles, long top tubes, low bottom brackets, slack head angles, short stems, wide handlebars, big brakes, tubeless tyres. These are all standard issue on a sorted Enduro bike. Bikes get lighter as the price tag increases. It’s a fact. Saving weight is worthwhile and desirable for any type of cycling. A heavy Enduro bike is something to avoid. It’ll just be a sluggish Trail bike or an underwhelming Downhill bike. Unfortunately getting a light bike that’s still capable of surviving an Enduro race involves spending a lot of money. An Enduro bike minimum: air sprung forks and shocks, carbon components, tubeless wheelset, single-chainring drivetrain, ‘dropper seatpost. Browse our current range of mountain bikes here. Tagged 27.5, 650B, buyers guide, enduro, full suspension. Bookmark the permalink.